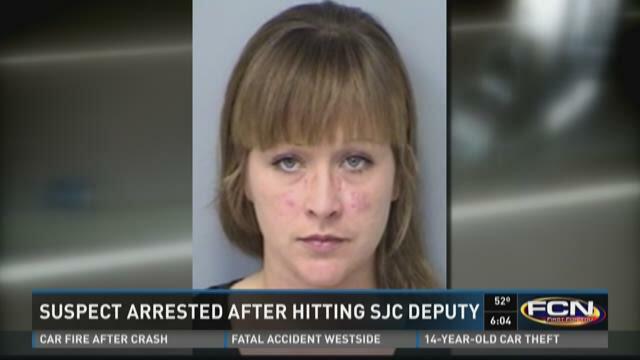 ST. JOHNS COUNTY, Fla. — A St. Augustine resident has been arrested after running a red light, striking the back of a deputy's cruiser and driving off after the accident on New Year's Day, authorities said. Gwedolyn D. Hughes, 31, has been arrested and charged with leaving the scene of a crash with injury and property damage after an accident early Friday morning, according to the Florida Highway Patrol. A St. Johns County Sheriff's Office patrol car was driving through the intersection of U.S. 1 and State Road 312 in St. Augustine under a green light when Hughes reportedly barreled through the same intersection, running a red light and smashing into the back of the patrol car, FHP said. Hughes allegedly drove off after the 2:15 a.m. crash. The deputy attempted to chase down Hughes in his cruiser, but due to the damage from the crash, his car failed to keep up, according to FHP. The sheriff's deputy was taken to Flagler Hospital with minor injuries and has since been released, authorities said. It wasn't until 2:30 p.m. on Saturday that deputies got a tip Hughes and her silver VW might be at a home on South Scenic Way. An anonymous caller said that a car matching that description with front-end damage was being towed away from there, authorities said. Later that evening, the driver spoke to FHP and sheriff's deputies in front of her home and admitted to being the hit-and-run driver, FHP said. Hughes was booked into St. Johns County Jail in lieu of $5,500 bond.